Having been established for over 35 years Simon Boyd are now one of the UK’s leading independently owned soft furnishing retailers. With stores throughout the Northwest employing over 70 highly qualified staff we pride ourselves on offering our customers a service that is second to none. We have over 50,000 options of curtain & upholstery fabric, with up to 50% off RRP in stock at any one time making us one of the largest fabric stockists in the UK. We import fabrics manufactured to our own design specifications from the best mills around the world offering our customers totally exclusive top quality fabrics at the most competitive prices. No other retailer can offer the comprehensive package that we offer to our customers from measure, design and manufacture to installation, carpets and wall coverings. Our fully trained staff are available to offer help and advice on all aspects of interior décor and soft furnishings, no matter how small or large the requirement may be. Whether a pair of readymade curtains and a pole for the customer to fit themselves or a full house commission needing total project management. Simon Boyd have the knowledge, experience and expertise to not only meet but exceed customer expectation. We export fabric and furnishings worldwide to our many overseas clients, international commissions are dealt with personally by our design team. Our services fully extend into the contract sector. From nursing homes to hotels whatever the scale or budget Simon Boyd are able to professionally fulfil any brief. Recent commissions have included a Loch side hotel in Scotland, a boutique guest house in Cheshire, a castle in Wales and the prestigious “Corinthia” hotel in London. Unlike our competitors we do not use any outworkers or sub contractors. All upholstery work and every made to measure item is manufactured in our own workroom thus ensuring complete quality control. All installation work is carried out by our own team of professional and highly trained fitters. 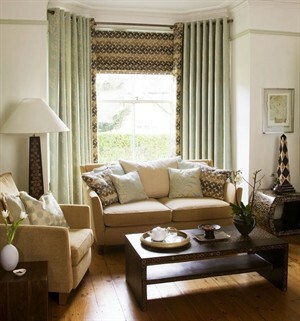 For the customer not requiring our made to measure service we have an extensive range of ready made curtains with up to 70% off RRP (selected stores) plus blinds, tracks, poles and a vast range of accessories. 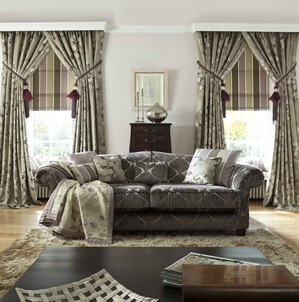 At Simon Boyd the customer does not have to compromise on quality and style in order to get value for money. “The best dressed homes wear” Simon Boyd.